AllStrong custom-designed Chinese Wok Range Series are engineered to meet chef's applications in unique oriental style of cooking such as "Canton", "Szechwan" or "Shanghai". 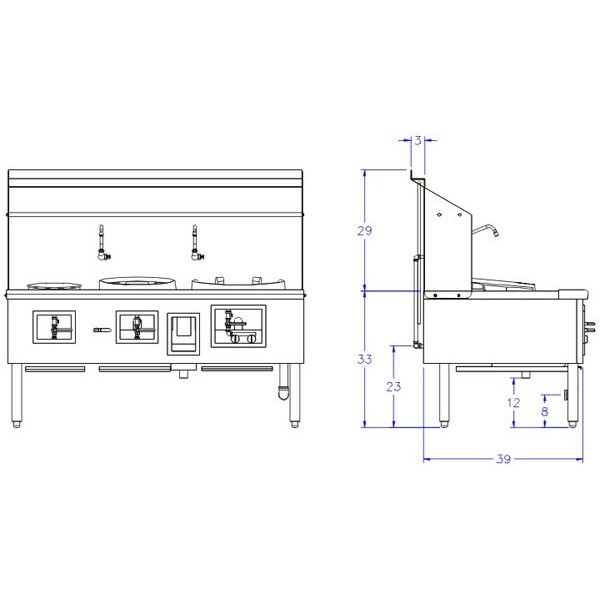 The unit is all welded heavy gauge steel frame construction with high quality stainless exterior, stovetop and high backsplash for rugged durability. Available burner selections and chamber sizes for our wok range are designed to meet individual chef's cooking demand whether in fast or slow cook style and high volume cooking. The wok range can be customized for any arrangement of open burners type and different wok chamber sizes. The "Water-Cooled Top" or "Water Fall Backsplash" system is designed to keep the wok range surface temperature devoid of excessive heat and to further prevent grease accumulation. Backsplash comes equipped with a controllable swing faucet for easy usage between chambers. Main burner shut/on valve, pilot valve and water-cooled control valve are conveniently located on the front panel for quick, easy and accessible daily operation. AllStrong Chinese Wok Range Series are ETL certified, with guarantee of the highest quality lines of commercial cooking range. · Stainless steel stove top. · Choice of back or front drainage tunnel. · Choice of back or front drain basket. · Choice of "Water-Cooled Top" or "Water Fall Backsplash" system. · Manually controlled swing faucet between wok chambers. 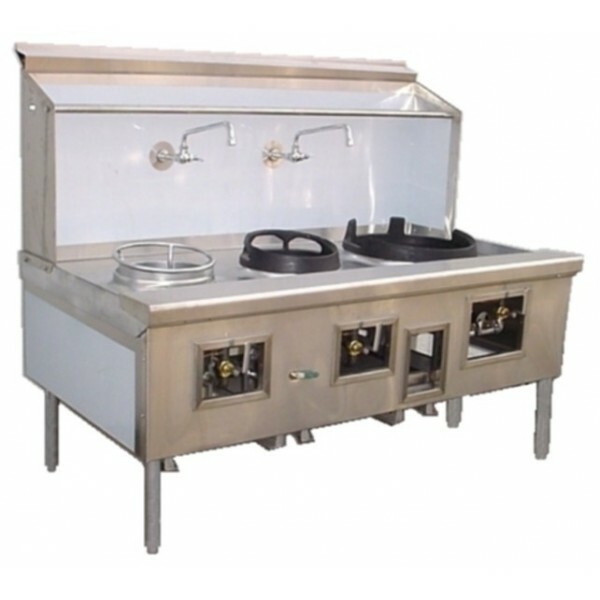 · Independent galvanized drip tray under each burner for grease and debris collection. · "L"shape gas shut/on valve handle provides easy access for knee level and hands free gas adjustment during cooking. · Standard wok chamber available sizes: 13", 14", 16", 18", 20", 22" and 24" inches in diameter. · Custom models available with up to 9 burners. · Seven types of burner available. ARE-1 1 62" 42" 30"
ARE-2 2 62" 42" 56"
ARE-3 3 62" 42" 72"
ARE-4 4 62" 42" 92"
ARE-5 5 62" 42" 120"
ARE-6 6 62" 42" 140"
ARE-7 7 62" 42" 160"
ARE-8 8 62" 42" 190"
ARE-9 9 62" 42" 210"